Scarred by traumatic events resulting from his past, former special agent Tae-shik (Bin Won) lives in solitude running a pawnshop in a rundown neighbourhood. His only contact with the world is through his customers and his next-door neighbours, a young girl named So-mi (Sae-ron Kim) and her mother, an exotic club dancer and drug addict. Neglected by her mother and shunned by the kids at school, So-mi gradually forms a bond of friendship with the loner Tae-shik. Described by Twitch as having "Truly impressive action. Taken meets Oldboy," the second feature from Jeong-beom Lee (Cruel Winter Blues), the writer-director who is being hailed in some quarters as Korea's answer to Takeshi Kitano (Zatoichi; Sonatine; Boiling Point). 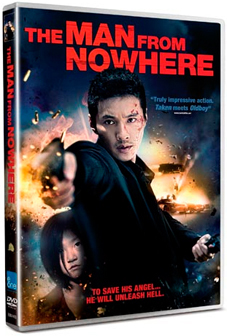 The Man From Nowhere (Ajeossi) is an action-packed revenge thriller that owes as much to the influence of blockbusters Taken, Man On Fire and Leon as it does to the heroic bloodshed movies of John Woo (Hard Boiled; A Better Tomorrow). A brutal, fast paced movie that balances scenes of violence with moments of emotional depth, the film boasts a number of stylish action set pieces, including what New Korean Cinema described as "arguably the best knife fight ever put on screen". A box office smash in Korea, where it became the highest grossing movie of 2010 and swept the board at the Korea Film Awards taking honours for Best Actor, Best New Actress, Best Cinematography, Best Music, Best Lighting, Best Visual Effects and Best Editing, The Man From Nowhere is one of the hottest Korean movies to arrive on UK shores in recent years. The Man From Nowhere (cert. 18) will be released on DVD by eOne on 11th April 2011 at the RRP of £12.99.